It seems like everyone wants to witness one of NASA's last space shuttle launch, and today's planed liftoff of the shuttle Endeavour is no exception. 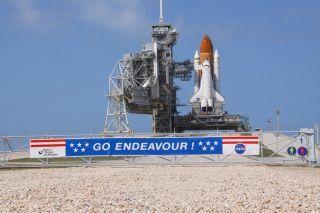 NASA has a long list of VIP guests for Endeavour's afternoon launch, and even Hollywood found a way to nab seats for the launch. According to NASA's official list, the space agency has invited no less than 118 VIP guests, with some of those invitees – such as President Barack Obama and his family – representing more than one person. That may not be as long as the royal wedding guest list, but it's a substantial number for NASA. Of course, this guest list is just one set of VIPs; the space agency expects more than 700,000 spectators in all to turn out at various locations all around its Kennedy Space Center in Cape Canaveral, Fla. Liftoff is set for 3:47 p.m. EDT (1947 GMT) today. Some folks aren't even on the list: Actors Levar Burton (one of the stars from TV's "Star Trek: The Next Generation") and Seth Green managed to snag tickets to NASA's official "Tweetup" for Endeavour's STS-134 mission. The a social networking event for Twitter followers at the Kennedy Space Center Press Site is part of NASA's public outreach efforts. Actor and Producer Levar Burton tweets with two devices during the STS-134 Tweetup, Thursday, April 28, 2011, at Kennedy Space Center in Cape Canaveral, Fla. About 150 NASA Twitter followers attended the event. Arizona Congresswoman Gabrielle Giffords, who is the wife of Endeavour commander Mark Kelly and is recovering from a gunshot wound to the head, is also attending and is listed among the congressional guests. 23. Adm. William Fallon US Navy, Ret. 37. Taber MacCallum, President, Paragon Space Development Corp.
102. Mr. Gabriele Salvestroni, Defence Attache, Italian Embassy U.S.
107. Ambassador Gary Doer, Ambassador of Canada to the U.S.
Actor Seth Green, right, takes a quick photo of two NASA Tweeps holding a Golden Orb Spider during the STS-134 Tweetup, Thursday, April 28, 2011, at Kennedy Space Center in Cape Canaveral, Fla., one day before the final launch of shuttle Endeavour. These lists are typically valid only for the launch day they are provided for. Any delays or changes to the launch can change who is able to attend, NASA officials have said in the past. Endeavour will fly to the International Space Station for a two-week visit to deliver a $2 billion astrophysics experiment designed to hunt for exotic subatomic particles. Four spacewalks are planned. After this mission, NASA plans to launch only one more shuttle flight. That mission will fly on the shuttle Atlantis and is currently slated to launch on June 28.